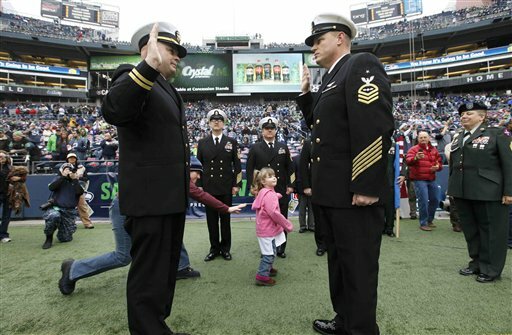 Do you have a favorite re-enlistment ceremony? Maybe a family member or VIP swore you in. Maybe the location was historically significant. Or maybe you were being circled by sharks at the time. Although he wasn’t defying death while raising his hand, Senior Chief Aviation Electrician’s Mate (AW) Mukunda-Krishna Tyson of Patrol Squadron 1 likely won’t forget his ceremony before Sunday’s Seattle Seahawks game. In the comments section, tell us about your most memorable re-enlistment ceremony and what made shipping over that day so special.